The Herstoric March on Women’s Equality Day will start at St. Stephen and the Incarnation Episcopal Church in Washington D.C. following the 8 a.m. blessing of the walkers. 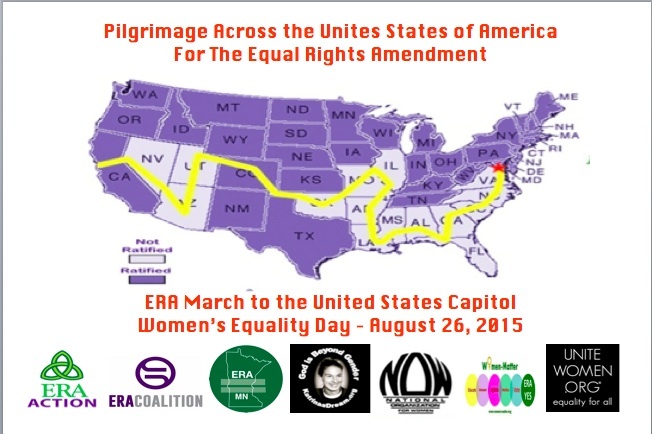 Many will accompany Helene de Boissiere Swanson for the final four miles of this 7,000 mile spiritual pilgrimage to the U.S. Capitol to promote the passage of the Equal Rights Amendment. The four-mile route passing the White House and on to the Upper Senate Park at National Mall where top feminists and human rights activists will hold a press conference, and then rally for the ERA. A statement from the Presiding Bishop and Primate Katharine Jefferts Schori of the Protestant Episcopal Church of the United States of America (ECUSA) will be read at the Press Conference. On August 27, 2015, the day following the march and rally, ERA Action in conjunction with Katrina’s Dream are coordinating a lobbying effort to call upon senators and representative to co-sponsor S.J. Res 15 and H.J. Res 51 respectively. The Equal Rights Amendment will empower women and provide protection for the LBGTQ community. Let’s change the world! Your support is needed. Please help to build a national and global presence in support of the passage of the Equal Rights Amendment. To participate in the Advocacy Action Events to follow the March Click Here. Join the Facebook Event to demonstrate your support, Invite your friends, and share the event everywhere. Send an email to all your friends and ask them to join in spirit. To join the Facebook Event Click Here. 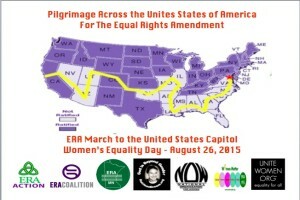 Contact your local media outlets and ask that they cover the Equal Rights Amendment Rally in DC. Send them a copy of the Press Release. To download a copy of the Press Release Click Here. The 15 non-ratifying states, in the order Swanson has walked through them, are Nevada, Arizona, Utah, Oklahoma, Missouri, Illinois, Arkansas, Mississippi, Louisiana, Florida, Alabama, Georgia, South Carolina, North Carolina, and Virginia. Katrina’s Dream is active in working with the homeless, developing sustainable practices, prison law reform, education in Botswana, developing programs in India, and the full inclusion of women in all areas of life.